State Bank of India (SBI) has collaborated with Tata Star Bazaar, one of biggest retail chains in India, to enhance the customer experience and increase acquisition using proximity marketing. SBI has deployed beacons at Star Bazaar outlets in two major cities – Mumbai and Bangalore. 2. Apply for Star Bazaar loyalty cards – Beacon notification in the store allows customers to connect with an in-store sales representative and apply for the Star Card right away. For loyal Star Baazar customers, the Card offers significant value back on all purchases at Star Bazaar, as well as periodic discounts and cashback offers. 3. Enhance the point-of-sale customer experience – Consumers very often forget about the card offers while checkout. Beacon notifications at the checkout counter would remind them of offers available on SBI cards. 4. Attract customers by pushing offers on SBI card in the nearest store – Going forward SBI is planning to collaborate with many other retail chains. The beacons deployed on these storefronts would attract customers by pushing offers on SBI cards at respective stores. 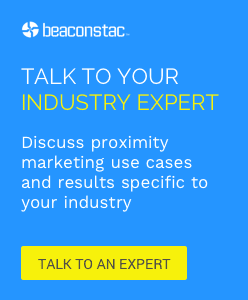 If you are planning to try out beacons, take a look at Beaconstac, that includes everything you need to get started. Using Beaconstac you can set up your own campaign, without a developer’s help!